I was incredulous when I looked up the word “sweet” in the dictionary and saw that it was not defined as Justine. Someone had obviously made a horrible mistake. Who….what….was Justine? 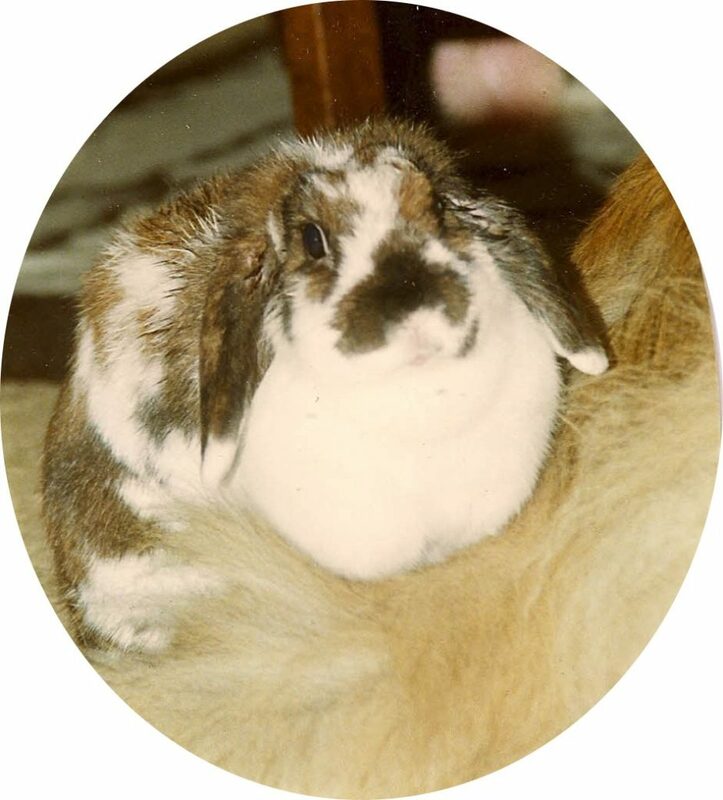 She was the sweetest, most gentle mini-lop rabbit in the entire “bun” kingdom. Her ears rested in soft folds on the floor. Her color was classified as “broken torte,” which was no more than a fancy way of saying she was splotches of black, brown and reddish hues on a white background. And, of course, she carried the signature mini-lop butterfly pattern just over her twitching nose. I didn’t intend to have Justine. I’d recently lost Jellybean, a black standard lop, following spaying surgery. I was going through all the turmoil accompanying an animal’s death, including horrible guilt pangs. I’d mentally reviewed, over and over, all the things I thought I could’ve or should’ve done to prevent the tragedy. I’d been an animal person my entire life but my experience with Jellybean left me convinced I had no business with rabbits. warning bells in my head. Mistake! Mistake! Shouldn’t have done it! Put her back before it’s too late. But it already was too late. Justine was immediate sweetness. Everything about her was velvet-like gentleness. It felt as if she were melting in my hands, like a small pile of cotton candy left in the sun. I cradled her under my chin. People would certify me as crazy if I told them what was happening but I felt, unmistakably, the hard knot that had lodged in my chest the preceding year begin melting. I felt cracks laying down spider veins that embraced the hurt of my father’s death. Other delicate fissures lassoed around personal career setbacks. And still others embroidered themselves into a lace-like quilt thrown over a variety of buried disappointments and hurts. This diminutive bunny was destined to be a great healer. I turned to the man watching me. “$25,” he said. I guess he had no trouble recognizing a sucker. I handed him three $10 bills. He turned and disappeared inside the small house, returning quickly with $5 and Justine’s papers. Since she was registered and had already won some shows, he figured I’d push for more awards and, eventually, breed her. “I have a list of shows,” he said. “No, that’s okay; but thanks. I don’t intend to show her or to breed her,” I answered. He looked at me. “Then what do you plan to do with her?” he asked. And that’s exactly what I did….in sickness and in health. Justine was smart. After just three weeks, I could place my face next to her head and ask for a kiss. The tiny tongue came out and licked me on the cheek. Then she lowered her head and butted me, gently. Sweet. Sweet. She won over the dogs and cats by just being Justine. She didn’t push herself on them. She simply waited quietly and, of course, sweetly, for them to make the initial overtures. Then, when they did, she met them with….you guessed it….sweetness. They couldn’t resist. She knew all there was to know about a litter box within a few hours. She had a spacious house in my office but the door was left open 80 percent of the time. She went in for the evening because I was afraid she might hurt herself if she roamed the house alone at night. Time passed and Justine became sweeter. I knew I should spay her but I couldn’t. I remembered Jellybean. Justine sat in my lap while I read or watched television. She sat quietly in the kitchen and watched me cook. Several months passed and then, suddenly, Justine stopped eating and drinking. I was holding her and stroking her, trying to figure out what was wrong, when I noticed a lump on the top of her head. I panicked. I crooned to her, calling her all the silly names I had for her. Jussie. Hon-bun. Butterfly nose. There was a long string of them. She snuggled deeper under my neck, and I somehow knew we’d begun that long day’s journey into the ultimate night. A friend told me about a vet who specialized in bunnies and birds. Expensive but good. I wrapped Jus in a towel, put her in my lap in the car, and off we went. It wasn’t long before I began an educational process about bunny health. I learned how critical it was that they not go more than 24-hours without eating, and how that time frame was even more critical for water. I learned how their bodies were capable of “walling off” certain infections. While she was talking and informing, the vet picked up a scalpel and made a quick cut into the lump on Justine’s head. The tiny bunny never moved. But I did. The vet began massaging gently around the mini-incision. Horrible “stuff” came rolling out. It was thick. It smelled. And it kept coming. And coming. “How can there be so much in that little lump?” I asked. That visit to the vet marked the beginning of my doing things that I never thought I could do. The vet handed me a syringe with a hooked end, and showed me how to dig into the abscess and flush it. More stuff (excretion) came out. “Do it until the solution runs clear,” she instructed, “and do it in the morning and evening. It’s important to jot down how quickly the pocket refills.” She told me to buy baby food, mix it with a small amount of water, put it in another syringe and feed the bunny until she was eating on her own. I did everything she said. Jussie was eating after two days of the baby food, but the abscess was quickly refilling with junk. That bunny was really unbelievable. When it was time for her “treatment,” I would sit down on the floor and wait for her to hop to me. She knew what was going to happen but she never resisted. In fact, she did all she could to help make things go smoothly. After a few days, I would say to her “Let me see your head, Jus.” Believe it or not, she actually hopped very close and then extended her head toward me as far as she could reach. She never flinched. It was as if she felt guilty about making me go through this ordeal. The abscess finally cleared up and we had a month of peace. Then another lump appeared. This time, it was on the side of her head. It was gone after several weeks of treatment, only to be replaced by another after a brief interval of quiet. Finally, the vet decided to do surgery, going in and literally cleaning all visible infections from the cranial area of her tiny head. The sweet lop came through it fine, along with five weeks of flushing four times each day. Then we had nearly five blissful months of good health. The hair grew back and covered the surgical scar. She hopped and ran and cuddled under my chin. Most people thought I was crazy if I said anything, but I was quite certain she smiled when I looked at her. Then it stopped. I walked down the stairs to my office early one morning to find Justine laying on her side in her house. I called her name but she didn’t move. Her food and water hadn’t been touched. I reached in and stroked her. She raised her head and then put it back down. I picked her up and brought her out. I checked her head for lumps. Nothing. I felt her entire body. Nothing. That is, nothing until I began feeling her stomach. There seemed to be a slight swelling but, regardless of what I could or could not see or feel, there was something seriously wrong. We left for the vet where x-rays revealed an enlarged kidney. I’m a long way from rich and there are times when I’m not even close to comfortable. A good month is when all the bills are paid. An excellent month is when they’re paid a few days early. But it never occurred to me to not have the surgery. This was, after all, Justine. I left the little bun at the vet’s. The surgery was done that afternoon. She died. I picked up her little body the next morning. I didn’t unwrap it to look at her, but I did hold her for quite a long time before driving home and putting her gently into the hole I’d dug. Who knows? Maybe…. if enough people are told about her….I can change the dictionary’s definition of “sweet” to read….quite simply….Justine. I know she’d like that. And perhaps I can also sneak her name into words such as soft and healing and melting. I would, after all, be speaking honestly since the little lop-eared bun did all those things for me. And, perhaps most importantly, she taught me that God does, indeed, often use the most unlikely creatures to do His work.